Think CC and you may well be thinking corn chips or coupe/cabriolets, or even cubic capacity. However, in Volkswagen-speak, CC indicates a new luxury model for the German brand as they continue to expand their model line-up. 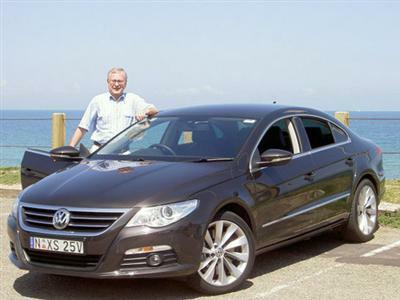 Positioned between the successful Passat range and the Phaeton (discontinued in Australia some years ago), the Volkswagen Passat CC is a 4 door sedan with a low roof line featuring seating for four occupants. This new model is aimed at placing Volkswagen into a new market segment, perhaps even competing with their own Audi brand. But it does allow the German marque (excuse the expression) to cover yet another marketing position with a 'parts bin' special, something that Volkswagen has specialised in for some years now. Of course, there is nothing wrong with that concept. In fact, it is shrewd use of resources and maximises the use of each component thus reducing 'unit' costs. There was a time when it seemed Volkswagen could do no wrong. However, whilst the Passat CC has plenty going for it, it is obvious upon the first encounter with this new model that the design seems to have suffered from a shortage of attention to detail. The shortfalls in design, in my opinion, are numerous. Specifically, the front door pockets are too small, the front 'grab' handles are too far forward to be useful, there are no rear passenger grab handles, the coat hooks are inconveniently located on the "B" pillar, the radio/CD player is more complicated than it needs to be and the rear seat is positioned quite low. By the way, an interesting aspect to the design is that it features "frameless" doors. The test unit was fitted with the 3.6 litre V6 engine which provides plenty of performance (factory suggest 0 to 100 km/h in just 5.6 seconds - an excellent figure for a largish 4 door sedan). The transmission was VW's excellent 6 speed automatic dual-clutch automatic working through the famous 4MOTION all-wheel drive system. Fuel consumption is rated at 10.5 litres per 100 kms on the combined cycle. A diesel engine is available in this model for those wanting lower fuel consumption, although the diesel has front-wheel drive only. A 68 litre fuel tank is fitted. The high performance V6 requires premium unleaded petrol. Emission levels is not something the V6 driver talks out loud about. With 254 grammes per kilometre, the CO2 levels mean performance is more important than emissions for the Passat CC V6 driver. Behind the wheel, the Passat CC pleases the most critical of drivers. Although the suspension is a little noisy on bad roads, the driving dynamics are fully satisfying. This car fits into the lower prestige segment quite well. The controls are very much like those of the VW Golf. The seating upfront is quite comfortable, with bolsters for hips and thighs. 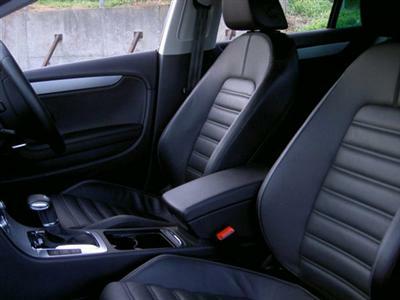 Leather trim is standard, so too is heating to each seat. Great features like a solid footrest for the driver, auto up/down power windows, 4-way adjustable steering column, good interior lighting, various 'cubby' holes, handy-sized glove box (with a neatly positioned handbook), dual-zone climate control air conditioning, trip computer, 6-disc CD player with MP3 compatibility, alloy wheels and a big boot are all part of the Passat CC story. Additionally, ESP and multiple airbags are standard. 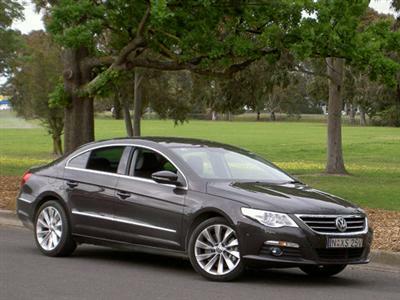 Without options, the stylish Volkswagen Passat CC with V6, DSG and 4MOTION is priced from $64,990 excluding dealer delivery fees and the various statutory charges. 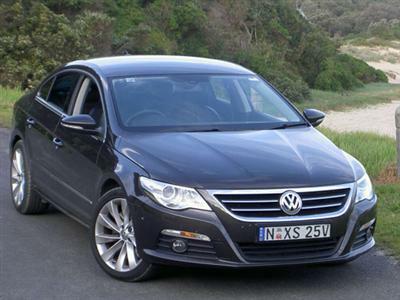 The lower priced diesel Passat CC is priced from $54,990 (again, excluding the traditional add-on amounts). Driving this car for 524 kms reveals that the new VW is a prestigious presentation well suited to grab a small share of the luxury car market. It provides an opportunity to please the driver but there are shortcomings in the design which, in my view, require attention.